Andrews -A Plan of the City of Amsterdam. Andrews, J. 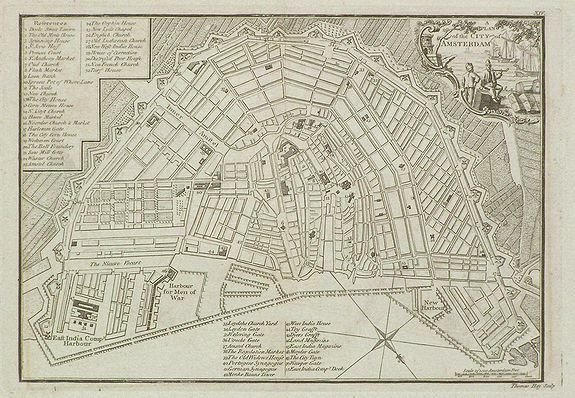 - A Plan of the City of Amsterdam. A Plan of the City of Amsterdam. - Andrews, J. Title : A Plan of the City of Amsterdam..
Map maker : Andrews, J.. Size : 6.9 x 10.0 inches. / 17.6 x 25.5 cm. Description :Nicely detailed 18th century map of Amsterdam, published in A collection of plans of the most capital cities of every empire, kingdom and electorate in Europe and some remarkable cities in the other three parts of the world . . . .
A key to 51 named landmarks includes the Oude Kerk, Westerkerk, Portugese Synagogue, and Royal Palace ("City House"). Condition : Almost Fine, with blind embossed ownership stamps.